Your teeth are designed to last for a lifetime with the right care. Unfortunately, even with the best preventive measures in place, tooth loss can still occur. If you have found yourself living with the daily complications of an incomplete smile, Schumacher Dental can help you fill the empty spaces with the next best thing to your natural teeth. With a commitment to build smiles that last, we offer the latest solutions to replace your missing teeth. No matter if you are missing one tooth, several teeth, or an entire arch, dental implants in Wakefield can help! Dental implants offer over a 95% success rate due to the unique process and materials that are used to treat tooth loss. Unlike traditional options, like dentures, they replace both the root and the crown of the tooth. 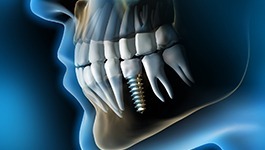 By surgically implanting a titanium implant post into your jawbone, you stimulate new bone growth to preserve your jawbone’s density while also creating a secure and stable foundation for your replacement tooth. It will closely look and feel natural to restore your quality of life. You will make an investment in your ability to chew, speak, and smile with confidence while also improving your oral health with a solution that can last for a lifetime. Now, all cases of tooth loss can be treated with dental implants if you are a candidate for the procedure. Depending on how many teeth you are missing, Dr. Schumacher will choose which type is right for you. Single Unit: When a single tooth is missing, a biocompatible implant post is surgically placed into your jawbone. An abutment is attached to the post to connect a custom-made dental crown. 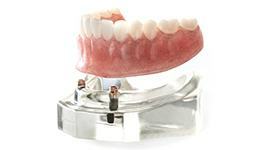 Implant-Retained Bridge: Now, you have an alternative option to hold your bridge in place. Instead of using dental crowns, one or two implant posts can be used. This is the perfect option if you are missing two or more teeth in a row. 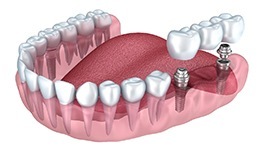 Implant-Retained Dentures: If traditional dentures have failed to give you the results you want, you can benefit from the security of dental implants. The denture arch will be held in place using an average of 4 implant posts. You will not have to worry about any slipping or irritation. In fact, when compared to traditional dentures, you will enjoy an increased biting force of over 70%. Mini Implants: Often, a bone grafting procedure is needed if your jawbone’s density has become compromised. Not with mini implants. They are smaller than traditional implant posts—perfect for those who have decreased bone density. If you are ready to stop living with the challenges of tooth loss, Dr. Schumacher can help. He will perform a comprehensive consultation to ensure that you are a candidate. With a customized treatment plan, he will help you fill the empty spaces in your smile with a predictable and reliable solution. To see if dental implants are right for you, contact Schumacher Dental today to schedule your consultation.